This plaid has an emphasis on the horizontal, and I’m sure from a distance it would actually look like a horizontally stripped shirt. It does up with snaps. 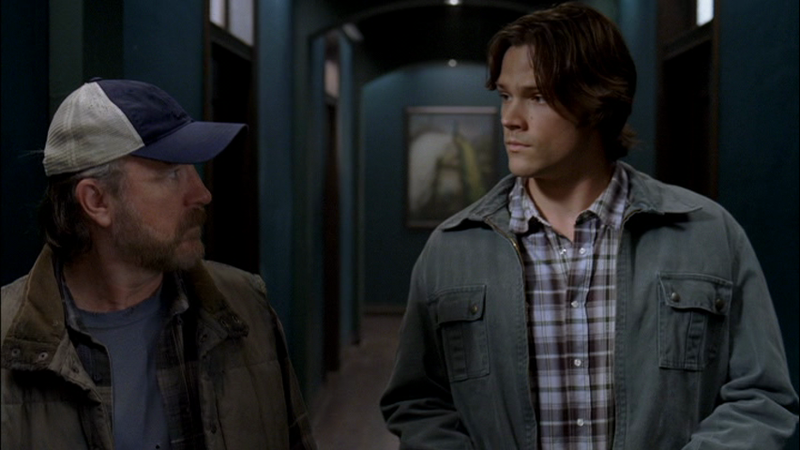 In Dream A Little Dream Of Me (3x10), Sam wears it at the end of the episode, after he’s killed the dream-walker. In Shut-Up, Dr. Phil (7x05), this shirt finally makes a second appearance! Sam wears it from when he enters the motel room with the rotten chicken feet until the end of the episode. 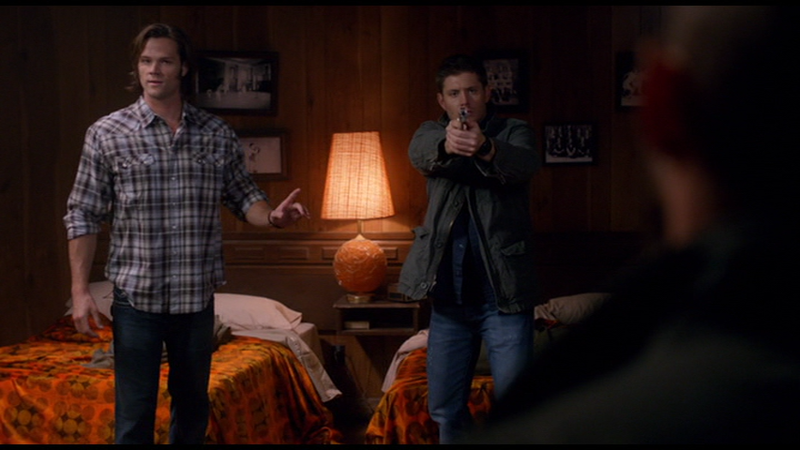 In Slash Fiction (7x06), this is the shirt that the leviathan pretending to be Sam wears. In LARP and the Real Girl (8x11), Sam wears this shirt after the case is wrapped up, when he and Dean say goodbye to Charlie and then Sam decides that they should stay for the Battle of the Kingdoms. In Goodbye Stranger (8x17), Sam wears this shirt in the beginning of the episode when he and Dean are hanging out at the bunker. In I’m No Angel (9x03), Sam wears this shirt from the beginning of the episode until he and Dean must put on suits to investigate the deaths as they look for Castiel. In Reichenbach (10x02), Sam wears this shirt when he leaves his hotel and Crowley finds him to give him Dean’s location. He wears it until the end of the episode. In Halt & Catch Fire (10x13), Sam wears this shirt when he and Dean are trying to prevent Delilah’s murder, and so Sam visits the scene of the car accident. In O Brother Where Art Thou (11x09), Sam wears this shirt when they go to Crowley’s throne room to recruit Rowena. In Beyond the Mat (11x15), Sam wears this shirt to the wrestling match after the Funeral and then keeps it on until the end of the episode. In Celebrating the Life of Asa Fox (12x06), Sam wears this shirt to Asa’s wake and until the end of the episode.